In Ireland there is always a scandal du jour—something that keeps the chattering classes, especially the political press, occupied. Currently, that function is filled by a government probe into the sale of a company called Siteserv, “a leading Infrastructure Support Services Group,” as it describes itself on its web page. Like a lot of companies, it ran into difficulty during the financial meltdown and found itself owing a lot of money to a bank. The bank also became insolvent and was subsequently taken over by the Irish government. The taxpayer-owned bank then sold off Siteserv at a loss for 100 million euro—plus five million extra euro to be paid to the Siteserv shareholders to give them an incentive to approve the offer. This is the sort of deal that gives capitalism a bad name. A dark, but necessary, element of capitalism is that there is risk in investing in the marketplace. When the government bails out shareholders, it distorts the market with all kinds of indirect bad results. This is not capitalism. It is what people call crony capitalism: manipulation by people in government and the well-connected to evade the laws of the market for the profit of a few. One of the main beneficiaries of the Siteserv deal was billionaire Denis O’Brien. Interestingly, one of his other companies has recently gotten some mention in the American press. In the aftermath of the devastating 2010 earthquake in Haiti, Bill Clinton (husband of then-Secretary of State Hillary Clinton) was named co-chair of the Interim Haiti Recovery Commission. Haiti legitimately needed all the aid money that poured into the country, but it was also a bonanza for companies that stood to get contracts to do all kinds of infrastructure work and, in some cases, exploit the country’s resources. It turned out that you had a much better chance of getting some of that money if you had a relationship with the Clintons. One of the main beneficiaries was Denis O’Brien, whose mobile phone company Digicel was hired to build a system of transferring money by cell phones. O’Brien had a history of paying lucrative fees to Bill Clinton for giving speeches and also for generous donations to the Clinton family foundation. (Bill Clinton’s speaking fees skyrocketed while his wife was Secretary of State.) Other companies were invited in to start exploiting Haiti’s mineral resources. Secretary Clinton’s brother was subsequently appointed to the board of a company that got a permit for gold mining. All of this is currently getting an airing due to the upcoming release of the book Clinton Cash by Peter Schweizer. Interestingly, it’s not just the conservative press giving the book exposure. The New York Times and The Washington Post have joined Fox News in making exclusive agreements with Schweizer. There is nothing illegal about what the Clintons are known to have done, and everyone is quick to point out that the Clinton foundation does many good things. But the coverage certainly undermines her claim to be a champion for “everyday Americans.” As Hillary Clinton famously told an interviewer, when they left the White House in 2001 they were “dead broke.” A dozen years later they were worth 55 million dollars. Bill Clinton is the only living ex-president to make 24/7 Wall St.’s list of the wealthiest U.S. presidents. In the last presidential election Democrats did a masterful job of turning Mitt Romney’s wealth into a political disadvantage—with no small amount of help, of course, from Romney himself. But at least no one accused him of making his fortune by trading on influence made possible by past, present and future high public office. When we visited Washington D.C. a couple of weeks ago, the tourist destinations on and around the mall were not exactly at their best. Yes, we did get to see the famous cherry blossoms, but the reflecting pool was drained and some of the other sites were similarly undergoing various bits of repair or renovation. 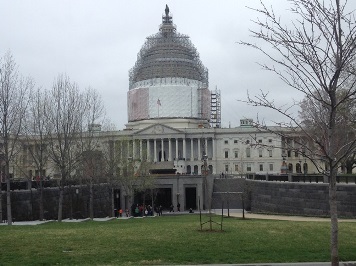 Most notably, the Capitol dome was obscured by covering and scaffolding that made it look like a trauma patient headed for intensive care. By contrast, the White House looked okay but was not that easy to get a good look at because of lush green spring foliage—not to mention serious security that keeps ordinary people at a greater distance than it used to. People in the know told us not to bother with the White House since, after going through the hassle for a tour, you don’t get to see that much anyway. It’s tempting to regard the physical appearances of the Capitol and the White House as being symbolic of the institutions they house. On one hand, the executive branch has become rather obscure. The long-term trend toward less transparency has continued unabated during the Obama administration—despite the president’s promises to the contrary when he was a candidate. 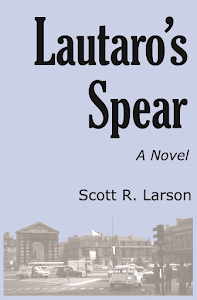 As for the legislative branch, it is clearly in serious need of repair—not only as a building but also as a functional part of the government. The congressional dysfunction continues, but it seems to be lessening a bit, with progress actually being made on a few bills—including a “fast track” trade bill—and, not insignificantly, a real budget rather than the spending auto-pilot resolutions that were the order of the day during the reign of former Senate majority leader Harry Reid. There are still fringe factions on the left and right in both houses ready to stall legislation, but the departure of Reid is the single best thing that could have happened in terms of Congress functioning as it was meant to under the Constitution. We had gone home by the time an off-duty postal worker caused a fuss—and raised anew serious concerns about security—by landing his flying lawn mower on the Capitol grounds. He was carrying letters for members of Congress, urging them to pass campaign finance reform. Whatever his methods, the man was certainly correct that there is way too much money in politics. Unfortunately, his solution just echoes what a few well-intentioned people—and quite a few hypocrites—have been pushing for years. If campaign finance “reform” ever had a chance, it was in 2008 when John McCain, an actual co-author of campaign finance legislation chose to accept public funding and Barack Obama, a self-proclaimed proponent of the reform, did not. One would reasonably think that that would have been the end of the issue. Yet now we have Hillary Clinton, who stands to break all kinds of records in raising money for her presidential campaign, giving lip service to “reforms” that, given recent Supreme Court decisions, would effectively mean amending the Bill of Rights. Leave it to politicians to solve a problem they created by giving the government more control over how private individuals can raise and spend money in seeking elective office. Why are there ever increasing amounts of money in politics? The answer is painfully obvious. The federal government is collecting and spending more money than it ever has before. And the federal government is regulating more areas than it ever did before. Under the current president, health care came under the federal umbrella, just as control of the internet is coming under federal jurisdiction. Money that was previously spent by large corporations in the private sector marketplace must now be spent on lobbying and on campaign contributions to seek favor—or avoid disadvantage—from the powers that can tip the scales in the marketplace. You can pass all the “reform” you want, but rest assured that the money will still find its way to Washington one way or another. That’s because Washington is where, increasingly, the decisions that affect the economy and everything are being made. And, in the process, ordinary citizens, who do not have the resources of a Hillary Clinton, will find compliance with the ever-increasing rules for elective office prohibitive. This year we spent most of the Easter school break in the United States. It was the first time in more than three years that we had been back. My wife asked me how it felt to be home. For me it did not really feel like being home since we were in Washington D.C. and Virginia—thousands of miles from the places where I have lived most of my life. Still, even though there are many differences between the Eastern Seaboard and the West Coast, it was definitely my own country. The money and the various ways of speaking English and the freeways and the sprawling shopping malls were all very familiar. Our fourteen-year-old loved being there. Too many places to shop and to eat and to find WiFi. She was fascinated by all the national flags waving, seemingly, on every business and home. She began counting them but gave up after the tally went into the hundreds. The Irish do not bring out their country’s flag except perhaps leading up to a big international sporting match. If you want to see the tricolor of the republic waving in front of people’s houses, your best bet is to visit certain neighborhoods in UK-administrated Northern Ireland. In the republic any flags you see on houses will likely be county flags—in advance of a provincial or national championship. The Virginia D.C. suburbs were unrecognizable from my first visit there 39 years ago. Much like Redmond, Washington, where I lived during the late 1980s and early 1990s, places that had recently been rural had been consumed by malls, business parks and acres of apartment buildings. And every person we dealt with in hotels, restaurants and businesses seemed to be an immigrant. Something that would not have happened on any of my previous visits: we had a delicious meal near Mount Vernon in a little hole-in-the-wall place that could have been transplanted directly from Mexico. As ever, the American entrepreneurial spirit is alive and well and it is best represented by newcomers who truly appreciate a relatively free economic environment. Having recently contributed my share to the ever increasing amounts of money individuals and businesses are obliged to send to Washington, I was not surprised to see that the federal capital and its environs are one area of the country that is booming economically. We were there to visit family, but it was also an opportunity to acquaint our daughter with the capital city of the nation of her birth. She is at an age where she can appreciate it. (I myself was nine years older than she is when I first visited Washington.) She was too young when we moved abroad for her to have any memories of living in the U.S., and she definitely gets an interesting view of my country via school in Ireland. She is essentially learning about it as a foreign country, albeit one that has been entwined for centuries with Irish history. 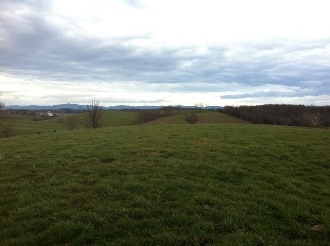 We experienced a bit of that connection when a group of us set out on a quest to Staunton, Virginia, to find the grave of one of the area’s earliest settlers, John Lewis. As promised, the grave was there, surrounded by a small iron fence on top of a hill overlooking what was once Lewis’s homestead. 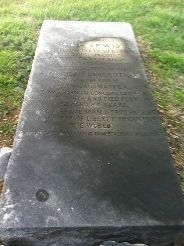 The gravestone was inscribed as quoted above. Of my eight great-grandparents, seven were born in Europe (three in Sweden and four in what is now Ukraine), but one of my great-grandmothers seems to have descended from a line that goes all the way back to the American colonies. From what I can determine, she may well be a great-great-great-granddaughter of John Lewis’s daughter, Margaret. If so, that gives me a scant Irish connection of my own, separate from that of my marriage. While Lewis’s grandparents were from England and Scotland, he and Margaret were born in County Donegal. 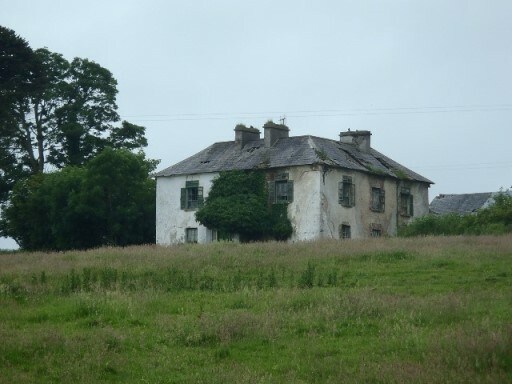 It is possible that the “Irish lord” whom he slew may have lived in the house in the photo below and which we found during another quest two counties to the north of our current home. The former Corkagh House in Donegal? This research has subtly altered my self-perception. For most of my life I had thought of myself as the product Europe-to-America emigration—with no direct personal connection to my country’s earliest history. The prospect of having connections to people who fought in the Revolutionary War has the strange result of making me feel more a part of a larger tapestry. In the end, though, the make-up of my DNA has little practical meaning. All that really matters is the here and now and who I am today. The one thing I certainly have in common with my various ancestor is the willingness to move to another continent as part of the process of making my own way in the world—not unlike many people I knew in California and the Pacific Northwest and not unlike all the people from myriad countries we encountered in D.C. and Virginia.